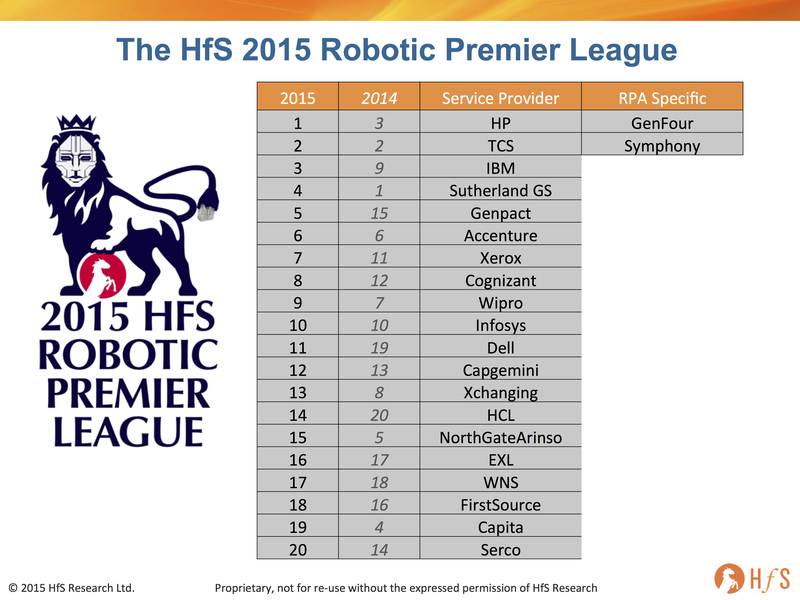 Back in April, we released the first Robotic Premier League Table to capture the “pre-season” placement of 20 different BPO service providers who were in the early stages of adopting robotic process automation (RPA). We shook up the market with what is still the most comprehensive assessment of the strategies, marketing and delivery of today's emerging RPA capabilities. In fact, it's the only comprehensive assessment of the strategies, marketing and delivery of RPA capabilities. Well, eight months is a very long time in the fast-evolving world or process robotization, so we’ve decided to update our analysis and provide a new RPL table to start 2015 to account for the early activity and investments being made in the space. Congratulations to HP, TCS, IBM, Sutherland Global Services and Genpact for topping the table this time around and for Genfour and Symphony Ventures in setting the standard for a new emerging category of RPA specific service providers. To establish these positions, Charles assessed each service provider using the criteria developed in his HfS RPA Maturity Model. It is still early in the evolution of RPA inside the outsourcing services market. Service providers are industrializing their capabilities to meet current and future client requirements. By the time we release our next RPL later in 2015 we expect to see the level of standard capability across service providers to have significantly matured further and for RPA to be part of most major outsourcing deals across the market. In short, RPA is becoming an arrow in every ambitious service provider's quiver.